**Attention: Spoiler-ish review ahead** When Isabelle Lee is forced by her mother to attend group meetings for her eating disorder, she soon discovers that the most perfect, popular girl, Ashely Barnum, is a part of the group too. As the novel progresses, the two form a toxic friendship that encourages the other to continue binging and purging. But as Isabelle gradually discovers, her new friend's life isn't as perfect as she initially thought. This is a difficult book to read. Not because it's a bad book, but simply because you're forced to see the world through the eyes of a bulimic. To see how they deal with pain by expelling food from their bodies. In the case of Isabelle, the main character, her pain stems from her mother's refusal to deal with the death of her husband, Isabelle's beloved father, Jacob. I thought Friend did an excellent job getting the reader emotionally involved in the story without going into too much vivid detail regarding how the characters went about their purging. Don't get me wrong, there were most definitely some uncomfortable, even disturbing scenes, but the descriptions were written in a way that let you view the "action" from far away rather than being directly in the scene with them. For someone who has a very weak constitution when it comes to vomit, I greatly appreciated this aspect of the writing. In my room, I ran straight to my closet. That's where I keep my stash, under one of Daddy's old flannel shirts that nobody knows I have. For the longest time after he died, I kept the shirt under my bed, wrapped in a paper bag. I would take it out whenever I missed him because it had his smell. Clean and warm, like grass. This shirt was legend. My mother was always trying to throw it out because it had missing buttons and the pocket that got ripped off in a football game. But every time mom tried to get rid of the shirt, Daddy would rescue it just in time. It was their special game. "There you are," he would say, dragging it out of the Goodwill bag and slipping it back on. And Mom would wag her finger at him, pretending to be angry. "Jacob Lee. You are impossible." This was his cue to chase her all around the house until he caught her and wrapped her up in his arms, in that big soft shirt that smelled like him. That was the moment in the book that really pulled me into the story, where I first felt Isabelle's pain. I really enjoyed following Isabelle's development throughout the novel, and even though it felt a tad "goody-two-shoes" at times, she still had enough triumphs and setbacks to make the story believable. The ending will leave the reader hanging, which makes me hope that maybe Friend will write another book, maybe this time from Ashley's perspective. Though seeing as how this book was published six years ago, I'm thinking that's not likely. Wow fantastic review. These types of book are very hard to read, but I am so glad that they are being written. Thanks for sharing this! This book sounds powerful. Have you read WINTERGIRLS? Perfect is not nearly as grave and depressing as Wintergirls. Though I absolutely loved Wintergirls; it's one of my favorite Laurie Halse Anderson books. 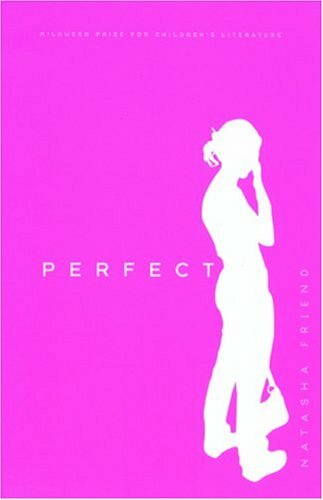 What I liked about Perfect was that the main character had triumphs as well as setbacks throughout the whole book. There were ups and downs - not just downs. But the writing in Wintergirls was much more lyrical and hauntingly beautiful.